The 23rd annual trauma symposium is a two-day program of cutting-edge, evidence-based presentations and discussions directed at a wide variety of current issues related to care of the critically injured patient. The symposium will feature nationally renowned leaders and local experts. 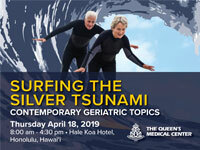 For more info: (808) 691-4406 or cme@queens.org.